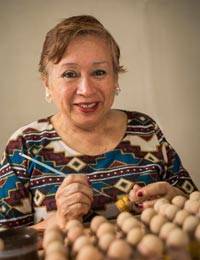 Dainty doves in beautiful colors become Christmas ornaments by Zoila Davila. In colonial Peru, the birds represented freedom and carried messages from one place to another. Crafted by hand, each ornament features an opening that holds a tiny scroll. The translucent paper is blank, so they can carry your own message of the season.